Struggling to lose those last 5, 10, 20 + pounds? Tried countless diets and always gain the weight back? Confused about what to eat to lose or maintain weight? Hit a plateau with your weight loss plan, and the weight isn’t budging? Have gone paleo or low carb and the weight still won’t come off? Feel like you’re doing everything right and still can’t lose weight? This FREE live tele-class is for you! 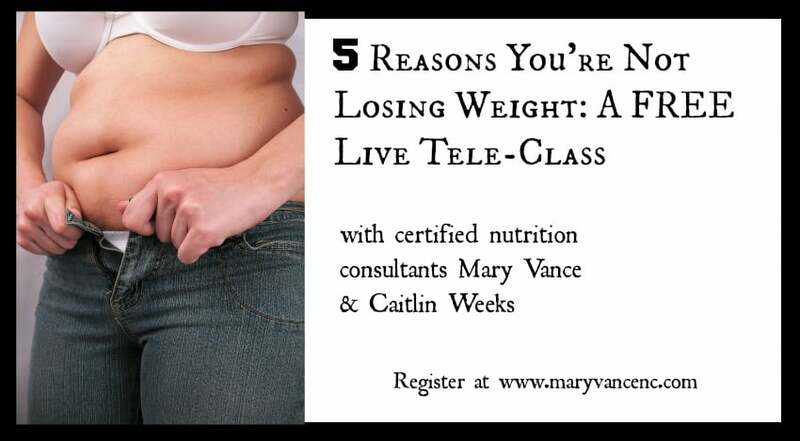 Join holistic nutrition experts Grass Fed Girl (Caitlin Weeks) and myself, Mary Vance, for a live tele-class: 5 Reasons You’re Not Losing Weight. The call will take place Wednesday, January 7, 2015 at 5pm PST/7pm CST/8pm EST. We will discuss the five most common reasons people struggle to lose weight or have trouble overcoming a weight loss plateau. This free call is for you especially if you are eating clean and feel you’re doing everything right, but the scale is not budging. You’ll get the expertise of not one but two holistic nutritionists for FREE, and we’ll leave some time to take your questions after the discussion. Sign up now and join us. Did we mention it’s free? PLEASE NOTE: You must register for the call. Please sign up below, and you’ll receive an email with the details on how to join the live tele-class. I registered for the podcast, but was unable to listen at the given time. Is it still possible to receive the information or hear the podcast?